“The vision is an Islamic state — Islamic society… Muslims will prefer sharia rule. But the vision for twenty years from now is for sharia law to be part of Germany, that sharia will be institutionalized in the state itself“. Yusuf, in a documentary series, False Identity. ⇒ 78% of Moroccan Muslims pray five times a day. ⇒ 33% of Turkish Muslims pray five times a day. ⇒ 40%Approximately of Both Groups Visit A Mosque At Least Once A Week. ….strictly adhering to Islam (increased from 77% in 2006, to 84% in 2015. ⇒ 7% Among Turkish Muslims. ⇒ 2% Among Moroccan Muslims. In Denmark, the trend of Muslims becoming more religious was apparent as early as 2004, when a poll showed that Muslims were becoming more religious than their parents, especially “young, well-educated and well-integrated women”. At the time, Professor Viggo Mortensen said, (PDF of article English) “The growing religiousness is not an expression of marginalization. We are talking about people who are well-integrated, but who want to be religious“. In 2006, 37% prayed five times a day, whereas the number had gone up to 50% in 2015. In 2006, 63% believed that the Koran should be followed to the letter; in 2015, it was 77%. Brian Arly Jacobsen, a sociologist of religion from the University of Copenhagen, was surprised by the results. “With time we would expect [that Muslims] would become more like the rest of the Danes, who are not particularly active in the religious sphere,” he said. Jacobsen thought that a possible explanation might have been the 20-30 new mosques that were built in the decade preceding 2015. The trends expressed by these polls are corroborated by studies and polls showing that many Muslims in Europe want to live under sharia law. According to a 2014 study of Moroccan and Turkish Muslims in (Germany, France, the Netherlands, Belgium, Austria and Sweden), an average of almost 60% of the Muslims polled agreed that Muslims should return to the roots of Islam. 75% thought there is only one interpretation of the Koran possible, and 65% said that Sharia is more important to them than the laws of the country in which they live. A 2016 UK poll showed that 43% of British Muslims “believed that parts of the Islamic legal system should replace British law while only 22 per cent opposed the idea”. In a 2017 study, which included a poll of 400 Belgian Muslims, 29% said they believe the laws of Islam to be superior to Belgian law, and 34% said they “would definitely prefer a political system inspired by the Quran”. The more than two million predominantly Muslim migrants that have arrived in Europe in recent years are only reinforcing the trend of growing Muslim religiosity on the continent. A 2017 study of predominantly Afghan asylum seekers in the Austrian city of Graz showed that the asylum seekers, mostly men under the age of 30, were all in favor of preserving their traditional Islamic values with 70% going to the mosque every Friday for prayers. The women were even more religious, with 62.6% praying five times a day, notably more than the men (39.7%). In addition, 66.3% of the women wore a headscarf in public. Half of the migrants said that religion now plays a larger role in their daily lives in Europe than it did in their native country, and 51.6% of the interviewees said that the supremacy of Islam over other religions was undisputed. The tendency of many Muslims to become more religious once they arrived in Europe was also on display in a new DOCUMENTARY series, “False Identity,” by Arabic-speaking journalist Zvi Yehezkeli, who went undercover to report on the activities of the Muslim Brotherhood in Europe and the US. In Germany, he encountered two young Muslims from Syria, who came to Germany via Kosovo, where they received help from a “British Islamic organization”. They had left Syria as secular Muslims, but on the way to Germany they lived for a year in Pristina, Kosovo, where, according to Yehezkeli, “Muslim Brotherhood organizations are active in helping refugees while turning them into devout Muslims. Ahmed and Yusuf arrived [in Germany] already praying five times a day“.1)The quote begins at 21:24 in the documentary. The statements by Yusuf and Ahmed follow immediately after. Yehezkeli asked them what their dream is. “The vision is an Islamic state — Islamic society,” said Yusuf, “Muslims will prefer sharia rule. But the vision for twenty years from now is for sharia law to be part of Germany, that sharia will be institutionalized in the state itself“. Author: Judith Bergman is a columnist, lawyer and political analyst. 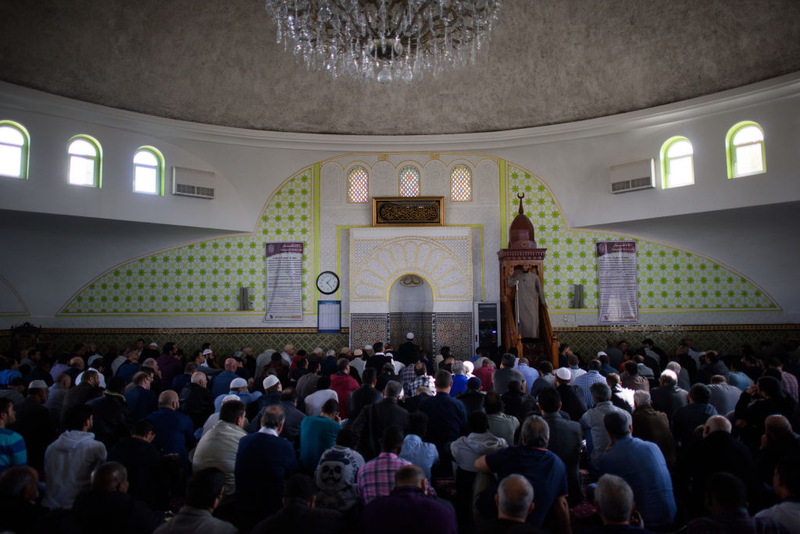 Article Lead In: A Dutch government report published in June showed that Muslims in the Netherlands are becoming more religious. 1. ↑ The quote begins at 21:24 in the documentary. The statements by Yusuf and Ahmed follow immediately after.